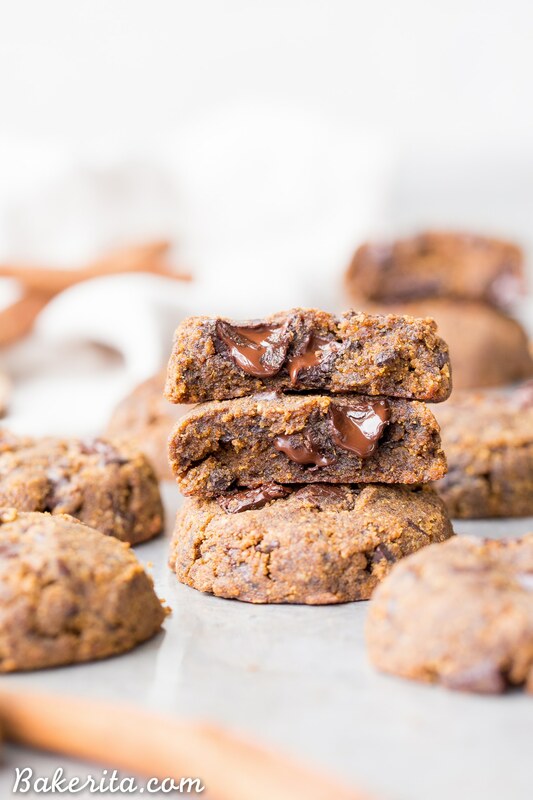 These Soft Chocolate Chip Pumpkin Cookies are a cakey and delicious spiced cookie that’s loaded with chocolate! 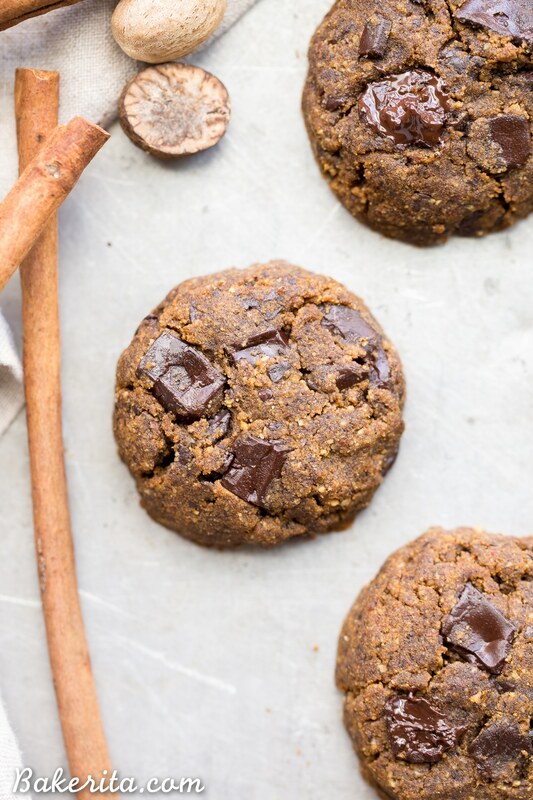 If you like softer cookies, you’ll adore these gluten-free, paleo + vegan pumpkin cookies. 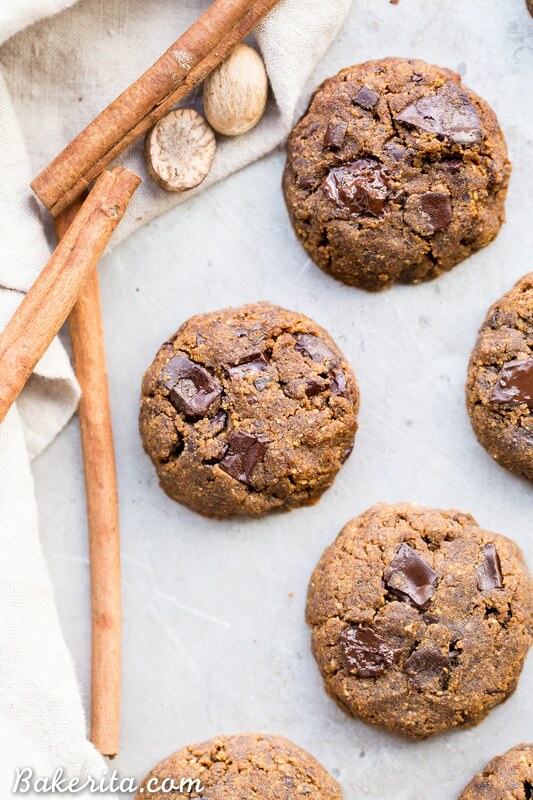 I’m going to be totally honest, when I tasted them, I labeled these a no-go because they hadn’t been exactly what I was going for, which was a crispy-edged, super chewy pumpkin chocolate chunk cookie. But then…I couldn’t stop snagging pieces of them when I walked by. Always a good sign. I ended up bringing them to Rosh Hashana dinner with my family, and they disappeared within 5 minutes of hitting the table, despite my family generally preferring crunchy/chewy things. These are delish no matter how you slice it. 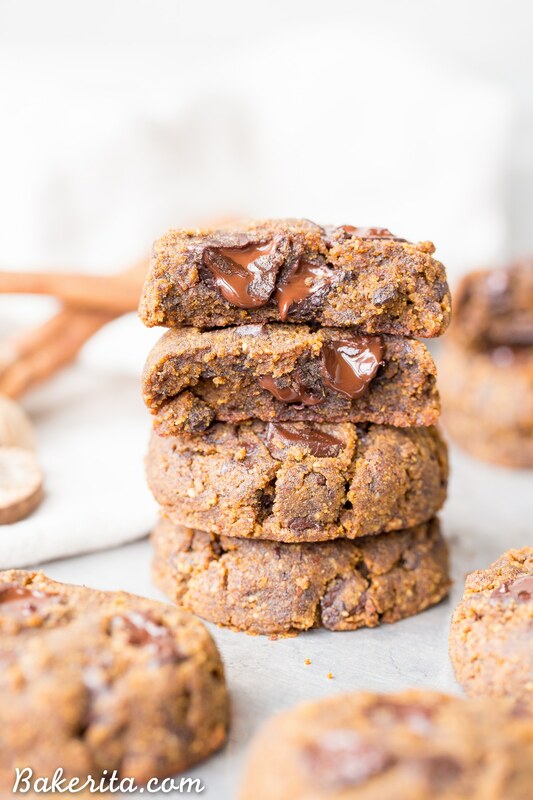 These pumpkin cookies are gluten-free, paleo + vegan, and they use two of my favorite go-to flours: coconut and almond. 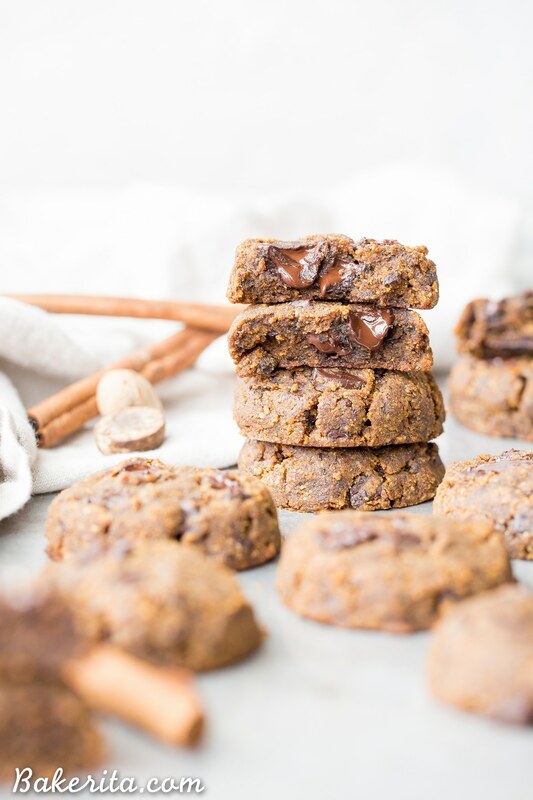 Almond helps provide a nice texture and flavor, while the coconut flour helps soak up the extra moisture that come from adding the pumpkin and the flax egg. There’s a pretty decent amount of pumpkin in here too – 3/4 cup! Which is definitely what helps them get that ultra soft, moist, cakey texture that helps them just meelllttt in your mouth. Of course, along with pumpkin, you must have the pumpkin spice crew. In these, it consists of cinnamon, nutmeg, and cloves…mmmmm. As usual, I recommend using chunks > chips for the best results. Freshly chopped chunks are always meltier because they don’t have waxes in them, like chocolate chips do, to make them hold their shape. Melty chocolate is always the winner in my book! If soft cookies are your jam, you’re going to absolutely swoon over these – I hope you’ll give them a try. Enjoy! In a large mixing bowl, combine the melted coconut oil, canned pumpkin, coconut sugar, flax egg, and vanilla extract. Whisk until completely smooth and combined. Add in the cinnamon, nutmeg, baking soda, baking powder, kosher salt, blanched almond flour, and coconut flour if using. Stir until a smooth dough forms and the dry ingredients are completely incorporated. Stir in the chocolate chunks. Chill the dough for at least one hour, or up to 24 hours. Don’t skip this - you need to let the dough chill so the coconut oil can firm back up and make sure the cookies don’t spread too much. When you’re ready to bake, preheat the oven to 350ºF. Line two baking sheets with parchment paper. Using a large cookie scoop (this one is my favorite), scoop dough onto the cookie sheet, leaving 2” between cookies. Bake for 11-14 minutes, or until crispy on the edges and baked in the center. Store in an airtight container. If your pumpkin is a bit watery or thin (like Trader Joe’s brand tends to be), you’ll want to add an extra tablespoon of coconut flour to help soak up that extra moisture. Libby’s and Sprouts Brand are typically thick enough on their own, but if you have it on hand, I’d recommend adding the coconut flour anyways if you want to ensure crispy edges. Talk about the perfect (and extra delicious) way to celebrate the start of fall! I certainly agree, thanks so much Casey! I must know what type of chocolate you use to get those perfect melted gooey chocolate puddles! Hi Meriem, I used Trader Joe’s 72% Pound Plus Bar for the chunks here! Thank you so very much Sarah! Do you think I could sub out the coconut flour and use tapioca instead? Would the ratio be the same? I love your stuff BTW! Hi Jen, thanks for the love! Unfortunately coconut flour is super uniquely absorbent and can’t be subbed out for anything else. I’d recommend getting your hands on some – it’s not too expensive and a little goes a long way, so it should last you a while. Enjoy! Oh man that’s crazy he’s so sensitive! You could try using an extra 1 1/4 cups of almond flour in place of the coconut flour, but I haven’t tried it so I can’t guarantee your results! Can I use chickpea flour as a sub here? Hi Holly, I’ve never used chickpea flour before so I’m not sure what the properties are or how it will perform in this recipe. You’re welcome to try it but I can’t make any guarantees that it will be successful. We don’t have canned pumpkin in my country. May I just roast or steam some and then puree it? Hi Catarina, yes that should certainly work! If it seems watery though, I’d recommend letting it sit in a fine mesh strainer to strain out some of the excess moisture before proceeding with the recipe. Enjoy! Hi Amanda, it’s on my Shop page but I’ve also affiliate linked it for you here: http://amzn.to/2fKM3b5 (I used the medium size here). Can I sub the flax egg for a real egg? I haven’t tried it but that should be just fine, hope you enjoy them Mary! I made these last night and the flavors were ON POINT! I replaced the 3 spices with equal parts homemade pumpkin pie spice and brown sugar instead of coconut sugar (I mix organic white with molasses for the richest flavor).. baked them for 10 minutes, flattened a little with a spatula, then baked for 3ish more minutes. They’re super soft and cakey, but honestly.. who doesn’t love cake for breakfast ;) Thanks for sharing this great recipe! These did not work for me :( I did add the extra tablespoon of coconut flour and let them sit in the fridge for 6 hours, but they’re too wet. I cooked them a full 30 mins and the centers are still wet. The flavor is nice though! Hi Melanie, sorry you had trouble!! Did you pumpkin puree seem particularly wet? That is most likely the issue, I always use pretty thick pumpkin puree. You can always try stirring in a couple extra tablespoons of coconut flour if it doesn’t seem cookie dough-like. Hi! Can I sub the coconut oil for almond butter and then use honey instead of sugar? Using honey for the coconut sugar will make the cookies too soft, especially with the pumpkin so I wouldn’t recommend that. I haven’t tried almond butter instead of coconut oil but it might work, can’t make any guarantees though!